-Or at least the man said to be the inspiration for the movie and comic book character seems to have been Irish. 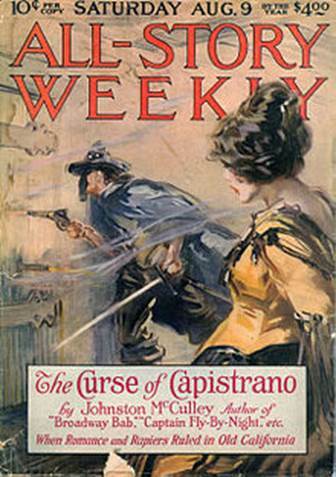 (Right: Zorro's comic book debut in The Curse of Capistrano.) Zorro, or "The Fox" was created in 1919 by the pulp writer Johnston McCulley and was a "Californio" living in early Los Angelos during the period of Mexican rule 1821-1846. In 1611 (or 1615) the colorful story of William Lamport began in Wexford, Ireland. He was born the youngest of four children to a Catholic, Old English family who settled in Ireland during the 12th century after the Norman invasion of Ireland. William was educated by the Augustinians and Franciscans in Wexford, and by the Jesuits in Dublin. He intended to continue his education in London, but was forced to leave after being arrested for sedition for distributing Catholic pamphlets in 1628. He is said to have fell in with pirates for two years and jumped ship in 1630. After fleeing to La Coruña, Spain, he resumed his studies at St Patrick’s College and hispanicised his name to ‘Guillén Lombardo’. As luck would have it, he came to the attention of the Marquis of Mancera whose late brother-in-law had known his old tutor from a posting in London. Lamport was summoned to the Spanish court and had begun to earn a reputation as a skilled swordsman and ladies' man. He eventually became a captain of an Irish regiment fighting for the Spanish in the 30 Year's War. In 1640 he was sent to Mexico to spy on the new viceroy the Marquis of Villena. But, it's also possible that it allowed him to get away from a young woman he had been living with and who was pregnant with his child. Lamport's older brother John, now a Franciscan and living in Spain, had urged the sinful couple to marry before he left for the new world. The new viceroy in Mexico was suspected of having sympathies with Portugal, and it was rumored that areas of Mexico were on the brink of rebellion against Spain. In response to the abuses of the Inquisition and local officials some time in 1641 Lamport is said to have begun plotting to overthrow the viceroy with the help of a former viceroy, Marquis Cadereyta, and in hope of enlisting the Indians, blacks, and creole merchants in an uprising. In 1642 he was betrayed and was arrested by the Inquisition. Among the charges against him was that of conspiring against Spain to liberate Indians and black slaves, as well as closely associating with Indian witch doctors and dabbling in astrology. He was even accused of trying to set himself up as king of an independent Mexico.